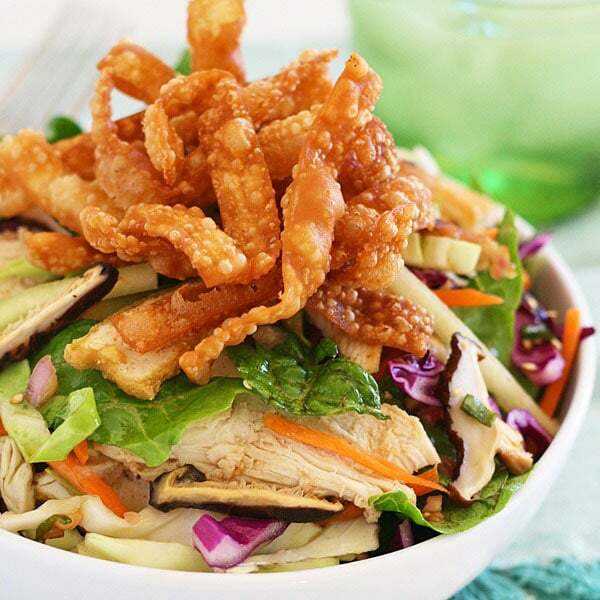 Chinese Chicken Salad - Easy, healthy, and delicious salad made with chicken breast and Chinese dressing and topped with wonton strips. One of my favorite salads to make is Chinese Chicken Salad—simple green toss with grilled chicken in a savory and tangy homemade Chinese dressing. I love making light, clean, and good salads as part of my healthy living lifestyle. There is no better time to make salads as farmers markets are sprouting up everywhere this time of year and you can get all kinds of fresh produce from your local farmers. I love the colorful mix of salad – cabbage, carrots, cucumber and mixed salad green. The vibrant color instantly enhances my appetite. Grilled chicken is always great for Chinese chicken salad. I also love the fried wonton strips at the top of my salad, which add amazing crunchy texture to the salad. 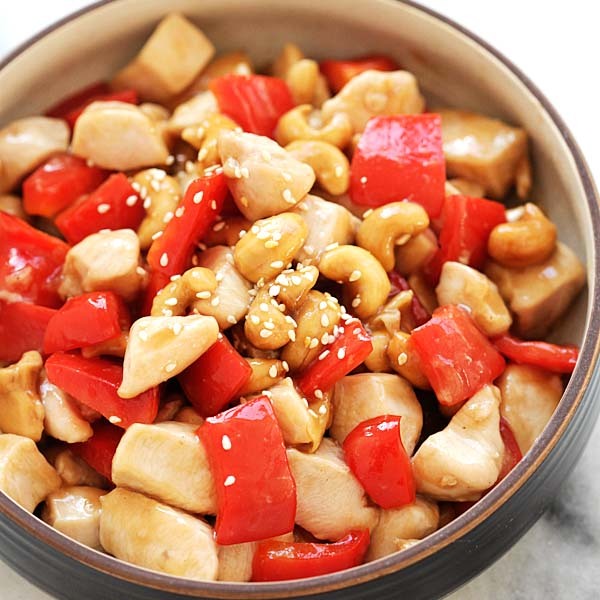 This salad will not be complete without my special Chinese chicken salad dressing, which is sesame ginger salad dressing packed with amazing flavors. Try my recipe the next time you want a light and refreshing salad! Whisk all the Salad Dressing ingredients together and set aside for at least 1 hour. Refrigerate until use. Marinate the chicken with salt, black pepper, and 2 1/2 tablespoons of Sesame Ginger Salad Dressing for 30 minutes. Discard marinade before cooking. Pan-sear the chicken on both sides, until the meat is completely cooked. Remove chicken and cool down. Cut into thin slices. Cut each wonton wrapper into 8 strips. Heat up the oil in a wok on medium-high heat. When the oil is heated, deep-fry the wonton strips until golden brown. 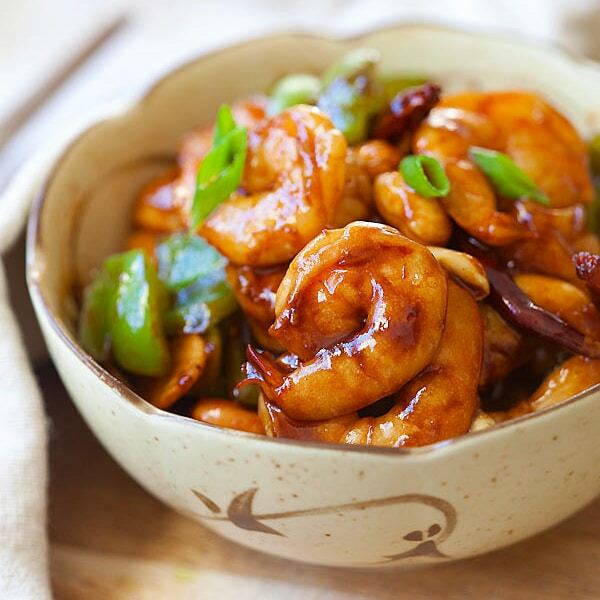 Remove from wok with a strainer and drained on paper towels. Set aside. In a large bowl, mix the salad greens, carrot, cucumber, chicken and the Sesame Ginger dressing. Toss well. 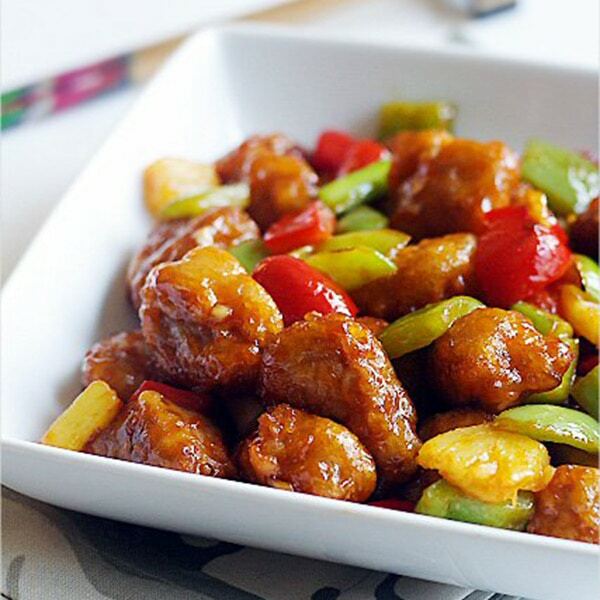 Chill for 5 minutes, garnish with crispy wonton strips and serve immediately. To substitute crispy wontons, use store-bought crispy chow mein or home-made crispy rice stick noodles. If you prefer a spicy Sesame Ginger Salad Dressing, add a teaspoon or two of chili sauce and/or chili oil to the dressing. I love it, looks so healthy and good! Love it I printed the recipe. You can store for a few days. The Panera Asian Chicken salad is very popular in our office come lunch time. We are so excited to try a homemade version, thanks for sharing! Thanks Bee we truly enjoyed this dish. My little girl happily continued eating even after we had long finished dinner!! That’s a great news! I am happy to hear that. I’ve never cooked with tofu. How much is 1 piece, how is it sliced, and is it deep fried or firied in a skillet? If you buy the boxed tofu in supermarket, they are already sliced. They are fried. Is there one of your preparations of tofu that you’d suggest to go along with this dish? I got this slab of tofu at the Asian supermarket and I’m kind of at a loss regarding how to prepare it. Stuff I’ve found so far have stated that it should be sliced and dried, including seasoned with salt, before frying, as well as possibly coated with flour, potato starch, rice flour, and corn starch. Then there’s pan-frying versus deep frying. Sorry, I’m kind of overwhelmed with choices. The salad, without the tofu, is great, though. I kinda went to town and added various other ingredients that have been in other versions of the dish, including almond slices, rice sticks, and Mandarin oranges or tangerines. The dressing/marinate really makes the dish.